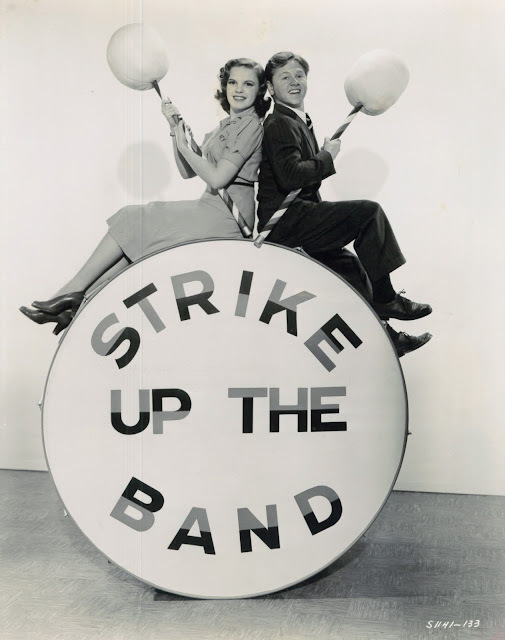 The second bundle of joy from Mickey and Judy as show-biz aspirants, Strike Up The Band shows how easy stardom might be had if luck is yours and proper ethic choices are made. Will Mick sacrifice his big break so a doctor can be flown in to fix a neighbor kid's broke arm? Yes, he can and does, from which flows an even better break (playing with Paul Whiteman's orchestra!) for being such a square shooter. Such was Classic Era fantasy of life dealing reward for selfless acts, and to watch Rooney here, you almost imagine it could work. Maybe movies had something in good paying off ... surely it did in terms of profit. Was a US public more ethically/morally upright back when movies taught toward those ends? Strike Up The Band cost more than immensely successful Babes In Arms ($854K as opposed to $748K), but got the expected uptick in worldwide rentals ($3.4 million to Babes' $3.3). Would you have let Judy sleep where there were dollars like this to be had? 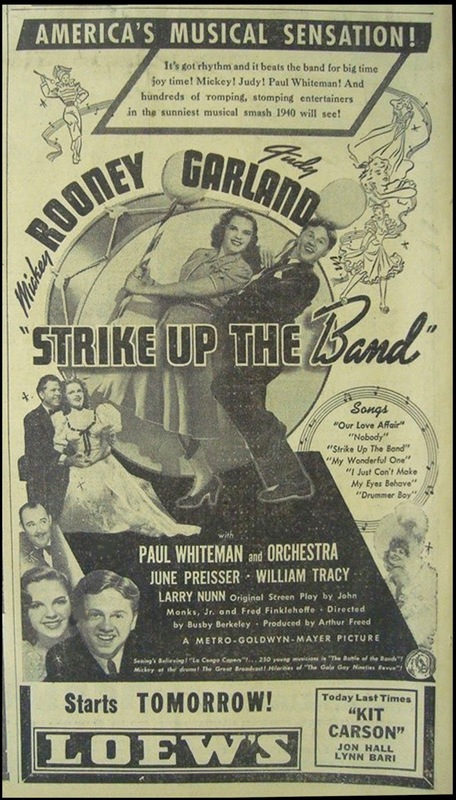 Make believe aspect of Strike Up The Band went beyond small town kids staking all on a show biz dream and winning, farthest remove from reality being Rooney/Garland as apple-pie product of loving and stable homes. Could either identify with their screen characters on any level? To read their bios is dip into American gothic. No quantity of fame would be worth price these two paid. Never mind parents, none of four involved worth a pinch of salt as providers, let alone nurturers. I'd guess that Mickey and Judy grew up thinking normal family life was strictly the stuff of dreams, which is likely why they functioned best behind Metro walls. Somewhere it's written that Rooney acted most like a human being while on sets with director and crew. Garland would fly apart like a hand grenade before age 30, the best of a career spent by then. I wish they could have had MGM bow-out of Summer Stock together, it so clearly a Mickey/Judy reunion by writer intent, but by 1950, she was all a public wanted more of, so Gene Kelly took up the part that should have been Rooney's. Strike Up The Band came when both were peaking. There was no youth pair to compare with R and G. Teams elsewhere tried, like at Universal where Donald O' Conner and Gloria Jean, or Susanna Foster, would mix and match, none novas like Rooney/Garland. Aspirants also lacked Metro resource and brilliant teamwork behind cameras that made each of R/G teamings an event. To call these "barnyard musicals" suggests modesty, a down-step from pageants where grown-ups sang and danced. 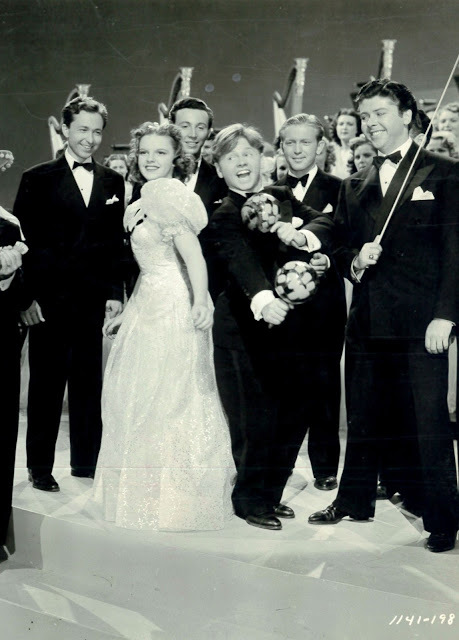 Actually, the Mickey/Judys were most reliably profitable of all musicals MGM had going. There would have been more had not each taken so much time to prepare and produce (unlike Universal where musicals were served off cookie sheets baked alike). 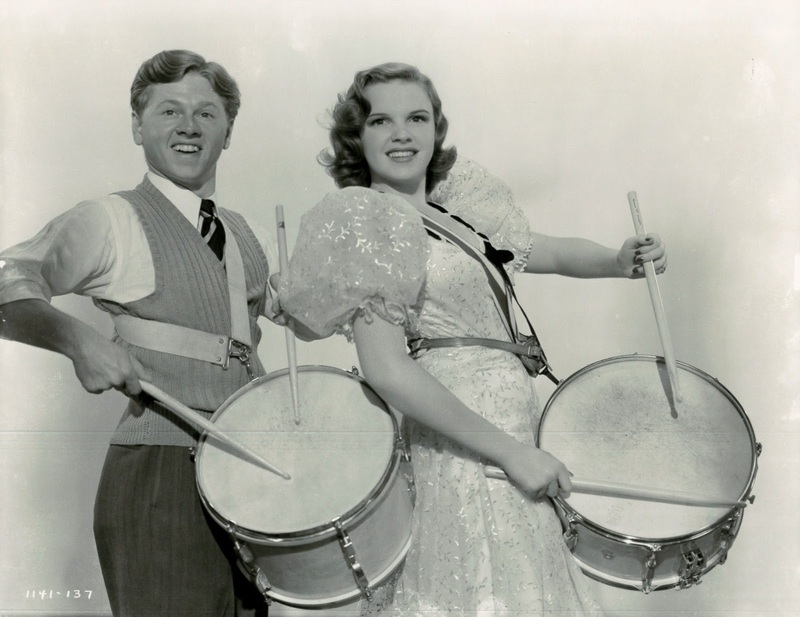 Must have been pain for Loew bookkeepers to watch Rooney/Garland age out of "Let's Put On A Show" format, just as it was to see Andy Hardy grow up and finish out of the money. That's Entertainment! kidded the group by montaging scenes of exuberant Mickey ("We can form our own modern dance orchestra! "), as if that happened in dozens of films rather than mere four. In a 1974 fresh out of ideas, other than recycle of old ones, mockery was salve for failure to pack creative gear, and who knows, laughing at betters may have been comfort in the face of going broke, which MGM surely was when adding "Boy, Do We Need It Now" to posters for That's Entertainment!, a for-once instance of truth in advertising. On the other hand, Strike Up The Band may shine brighter as excerpts rather than whole product, two hours a tad long to stay aboard such light vessel. 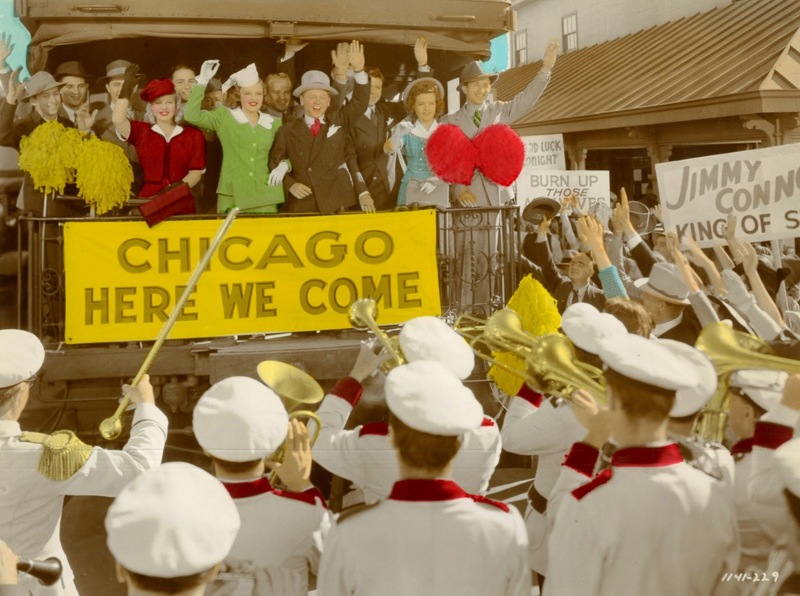 Narrative in a nutshell: Mickey and Judy want to be musical stars and figure Paul Whiteman can help them do it. In a meantime, there is frustrated love (Judy for Mickey), broken dates (him lured by acrobatic back-flip of June Preisser, offscreen Rooney no doubt appreciative of possibilities in that), and parent/authority figures who must be respected even as they impede progress toward footlights. One thing teens never did at MGM was question authority. How many youngsters of unstable family background dreamed of Lewis Stone for a father? And then there is Paul Whiteman. 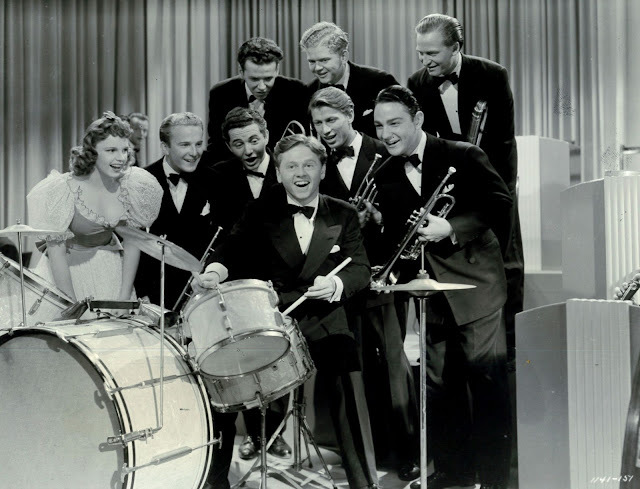 Belittled today as false prophet and bogus King Of Jazz, he ruled roost that was bandstands from the 20's till swing eased him toward emeritus status and remain of a career where Whiteman kept baton aloft, pioneered among big names doing D.J. duty, and took his act to most secure of memory banks that was TV. In short, Whiteman did all things right in context of his times, cash and comforts served, if not posterity's approval. 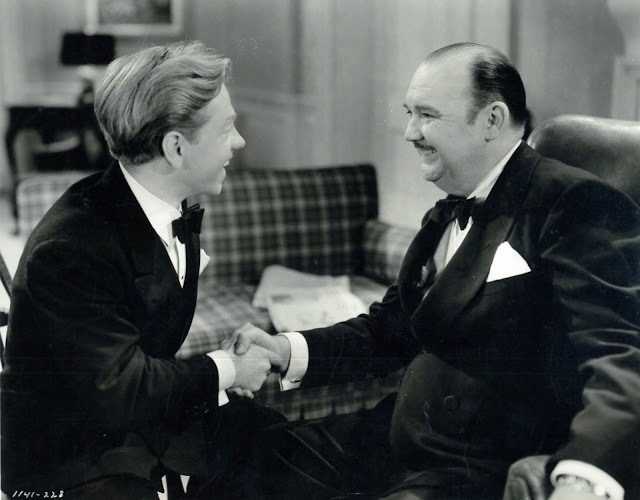 He's ideal as show biz mentor to Mickey, repeating familiar movie maxim that being a great guy is always preferable to money or success, to which 100% of performers then/now would say "Oh, yeah?," but Whiteman sells the speech and ideal, which for all we know, the bandleader bought into himself. Strike Up The Band is part of a Rooney/Garland DVD set from Warners, Mick supplying another of his odd-intense old age intros, plus the big conga number is here in sort-of stereo, a result of 1940 stage recording where two or more microphones were placed among the orchestra to bracing effect. It's an extra on the Band disc. Re: Paul Whiteman. We seem to have entered a time when the great achievers of the past are being denied credit by people who will achieve nothing. These are the ones who sit on their verandas looking down their noses at the working stiffs as they pass by. I'm looking forward to seeing a proper restoration of KING OF JAZZ. Agreed. I like Paul Whiteman a lot, and very much look forward to the "King Of Jazz" restoration that is underway at Universal. I remember chats with collectors who were well aware of Whitemans's discredit... but they actually liked all of his recordings. He was a very influential performer, jazz ensembles in Argentina followed his stepts although adding domestic scores and influences. Tango musician Francisco Canaro directly emulated him, increasing the size of his orchestra adding instruments far more associated to jazz to tango orchestrations and probably the way he presented himself in front of the public, even though Canaro's himself always managed to be a very original artist. 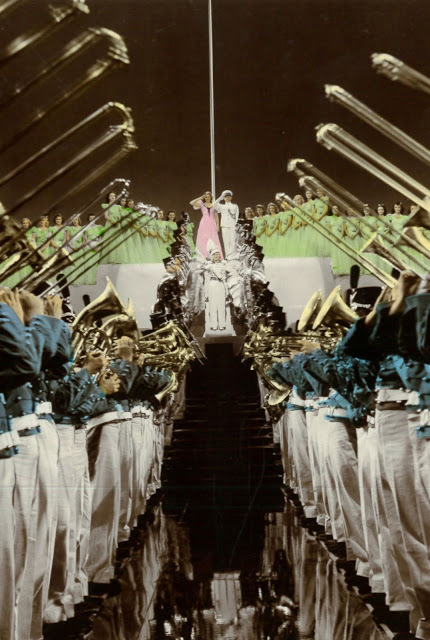 I think Whiteman simply became easy shorthand for jazz "vulgarized" into popular music, much as Disney became easy shorthand for insipid sentimentality (while his work isn't as squirm-inducing as much 30s animation, save Warner's and Fleischers'). Heck, Whiteman's NAME played into that scenario. It's tempting to blame envious critics, but the truth is a little more nuanced. We often see individuals made into symbols of their field (sometimes through their own press agentry, sometimes through lazy press and/or semi-attentive public), lionized as the creators of everything, then despised for "stealing" credit or fame from the rest of the innovators who only later got some exposure. For ages, Chaplin was the be-all and end-all of silent comedy; he was the only silent clown most people even recognized. When Keaton finally won modern recognition, many of his boosters felt it necessary to belittle Chaplin and his brilliance, usually attributing to him the cheap pathos churned out by lesser comics. In the new Rooney bio, it's said that in the '70's he proposed a clip show of his career, with contemporary bookends, to Jack Haley Jr. From there it became That's Entertainment, with Rooney paid scale. Chaplin is and always will be bigger than those determined to drag him down. Likewise D. W. Griffith. When we consider that $2 a seat in 1915 is over $50 a seat today and that in its first run THE BIRTH OF A NATION was seen by over four times the population of The United States in America alone not only is it easy to see that not only has no other film maker taken his risk nor duplicated his success but also how far the art and industry of motion pictures has fallen. Likewise Paul Whiteman opened so many doors that it makes the closing of the door on him all the more ridiculous. The big band era of the 1930s came about because sound put so many musicians who had played in orchestras for silent films out of work. "In a 1974 fresh out of ideas, other than recycle of old ones, mockery was salve for failure to pack creative gear, and who knows, laughing at betters may have been comfort in the face of going broke, which MGM surely was when adding "Boy, Do We Need It Now" to posters for That's Entertainment!, a for-once instance of truth in advertising." We seem to live in an age where irony and mockery have replaced sincerity and joy. I would never for a minute think Mickey and Judy in their private lives where like their on-screen selves, but, to many, many people, the values espoused by them were the currency of their everyday lives. We were a different people then, and the films we enjoyed reflected that.